The long-awaited follow up to the Pavel Haas Quartet’s Gramophone Award winning Schubert album in 2014, which itself followed the Gramophone Recording of the Year Award for the Dvorak album in 2011. The Pavel Haas Quartet have now put all their energy to the service of the music of Bedřich Smetana. Even though his chamber music is very modest in scale, each of these works can be said without exaggeration to be a foundation stone of Czech chamber music. They are personal works, often with a strong autobiographical element. He wrote both quartets towards the end of his life, when he was already suffering from deafness. The first quartet, 'From My Life', is programmatic: "I wanted to express musically the course of my life… The composition is almost entirely private, and so intentionally written for four instruments that should talk together ‐ as if they were a close circle of friends ‐ about the things that have shaped me so significantly." Quartet No.2 seems almost to belong to the 20th century in the unconventionality of its composition – something that greatly disturbed Smetana’s contemporaries. For the Pavel Haas Quartet, Smetana's music is an obvious and clear choice, not a sudden revelation; it is "only" the concept of the music itself that is revelatory. The Quartet doesn't try to make itself stand out in some superficial, external way – it doesn’t bet on extremes. Its originality comes from its efforts to penetrate to the very core of the work and from the thrilling and comprehensive way in which it achieves this. So, how does our immortal Smetana sound in the twenty‐first century? You will find the answer on this stunning recording. 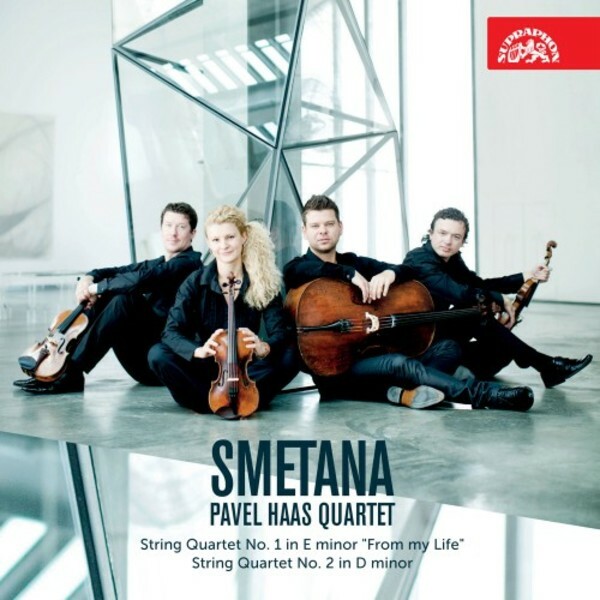 'From My Life' – classic Smetana, inward‐looking and timeless, as heard by the Pavel Haas Quartet. Since it burst onto the scene a decade ago, the Pavel Haas Quartet has become one of the hottest tickets in the string quartet repertoire. The latest in a long line of Czech quartets, it has wisely paced itself in terms of recordings, with the result that its steadily growing catalogue of discs – from Janáček and Haas to Prokofiev, Dvořák and Schubert – have garnered numerous awards and critical accolades. Now they turn their attention to the father of the Czech string quartet, Bedřich Smetana, and the results are revelatory. Smetana may be best known for his operas and symphonic poems, but he used the chamber music genre for his most personal outpourings. His First Quartet was written in 1876, in the wake of the tinnitus that caused his total deafness. Subtitled 'From My Life', it was given an autobiographical programme by Smetana, including his youthful enthusiasm for the arts (first movement), for folk music (second movement), and the bliss of his first love (third movement). The Pavel Haas Quartet clearly love this music and relish every detail while retaining a clear sense of forward momentum throughout. Dance rhythms are deliciously sprung, and textures are wonderfully transparent even when the tone is at its most full-blooded. Indeed, it's the depth of tone that marks the PHQ's performances as really special; whether it's the long-breathed opening solo of the Largo, or just the first-note launchpad of the second-movement polka, Peter Jarůšek's cello playing underpins the ensemble with a glorious richness, while Pavel Nikl's viola solos bring an ideal soulfulness. The opening of the finale is tremendously uplifting, while the episode towards the end which illustrates the onset Smetana's tinnitus in startling fashion (a piercingly high E on the first violin) is emotionally devastating. There have been many fine recordings of this work over the years, but this new one is undoubtedly the most vivid. The same can be said for the PHQ's account of the less familiar Second Quartet (1883). Here the programme may be more generalised (Smetana spoke of 'a mist of despondency and grief'), but the music's episodic nature, with its startling juxtapositions of ideas, looks forward to Janáček's quartets of several decades later. From the manic fortissimo outburst of the very opening, this is a performance of ferocious intensity and heady passion, the contrasts perfectly judged and projected with exceptional vividness. Underlying folk references are teased out with carefully deployed rubato, and the recording captures every detail. This latest disc is a worthy addition to the Pavel Haas Quartet's illustrious discography, and a must-have for lovers of chamber music and Czech music alike.